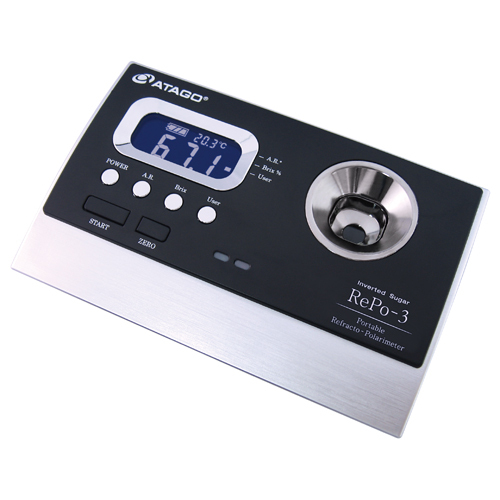 Portable Refracto Polarimeter | ATAGO CO.,LTD. Brix alone can only indicate the overall amount of dissolved solids in a solution. With REPO-1, it is possible to determine if a product has been adulterated by measuring the optical rotation. For example, fructose rotates light to the left while glucose rotates light to the right. If a sample has been adulterated with glucose, it will make the optical rotation readings appear more positive than a pure solution. Press "User" to select the desired scale: Purity, International Sugar Scale, Specific Rotation, and Concentration. Measurements are evaluated against pre-set tolerancelimits, and the result is indicated by green or red light. ❶ Fill the sample stage up to the fill line (approx. 3mL). A fusion of index of refraction and angle of optical rotation making the invisible,visible. Brix can only indicate the overall amount of dissolved solids in a solution. With REPO-1, it is possible to determine if a product has been adulterated by measuring the optical rotation. Announcing an All-in-One, refractometer and polarimeter hybrid unit. As little as 3mL sample, Repo-1 can measure both brix and optical rotation of the sample. With the press of a button, purity, international sugar scale, specific rotation, and concentration can be displayed. Users can also set an upper and lower measurement limit. An indicator light alerts the user if a measurement value is within the limits, allowing for optimal efficiency.“Could a Repo-1 be used in our field?” “How about for my unique application?”We look forward to hearing from you! The RePo-2 can determine the amount of fructose (%) in HFCS. Like the RePo-1, the RePo-2 is a two-in-one refractometer and polarimeter hybrid.In addition to angle of rotation and Brix, the RePo-2 also converts and displays the amount of fructose (%) within HFCS. The RePo-2 is ideal for various industries such as food and beverage, or sugar refining. The RePo-3 can determine the amount of invert sugar (%) converted from sucrose. In addition to angle of rotation and Brix, the RePo-3 also converts and displays the amount of invert sugar (%) derived from sucrose. The RePo-3 is ideal for various industries such as sugar refining. The RePo-4 can determine the amount of fructose (%) and honey moisture (%). In addition to angle of rotation and Brix, the RePo-4 also converts and displays the amount of fructose (%) and honey moisture (%). The RePo-4 is ideal for total quality control of honey. The RePo-5 can determine refractive index(nD). In addition to angle of rotation and Brix, the RePo-5 can also display the refractive index (nD) of a sample. The RePo-5 is ideal for quality control in various industries such as fragrances, cosmetics, or pharmaceutical.RePo-5 satisfies Pharmacopoeia standards. A package for the RePo-1 that includes syringes and single-use, disposable filters. 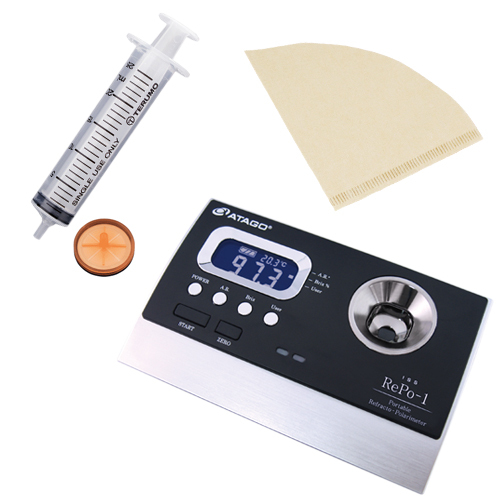 By using a syringe and a disposable filter, it is possible to measure stabilized values of substances such as raw sugar and other materials. These accessories are also sold separately.